Introducing the COZYROC SSIS+ library with support for integration and migration of Microsoft Active Directory / LDAP data. Available on the market since 2017, COZYROC makes it easy to integrate or migrate data to and from LDAP / Active Directory and will preserve the integrity of your data by always using the recommended Microsoft API. You can use any application, service or database supported by SQL Server Integration Services (SSIS) or COZYROC’s toolkit as the source or destination for LDAP. The toolkit is easy to use and follows the same guidelines and principles used by the standard out-of-the-box SSIS components. In addition, COZYROC also provides short and informative demonstration videos, providing step-by-step instructions on how to get started. Stores the credentials and functionality for connecting to LDAP server. Retrieves data from LDAP object. Ability to specify a filter clause. Inserts or updates data in LDAP object. Provides information about records with errors. Unique technology which allows user-defined reusable scripts for additional LDAP integration scenarios. 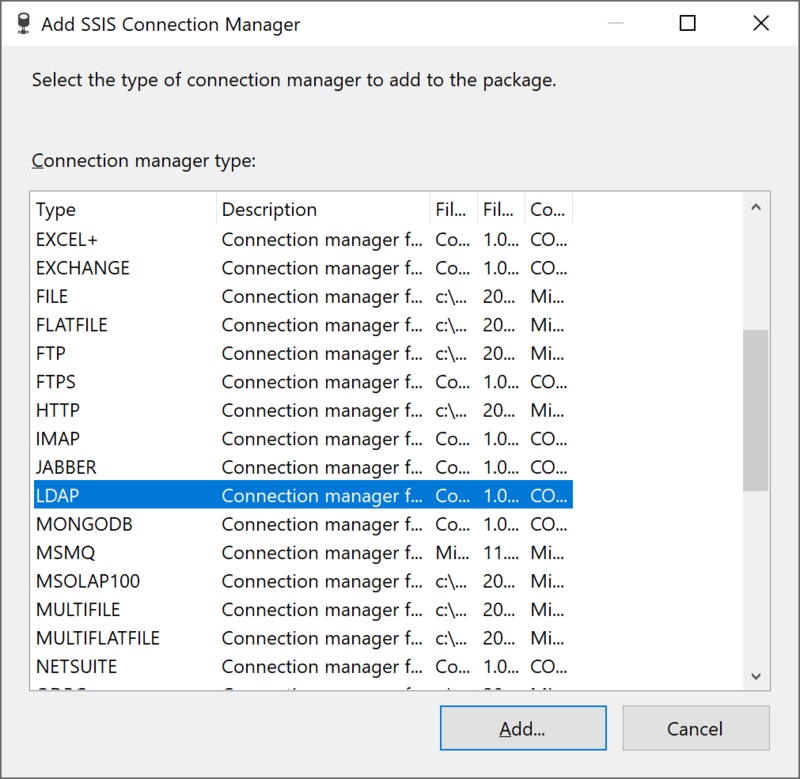 LDAP Connection Manager is SSIS Connection Manager for establishing LDAP / Active Directory connections. Use the API to build components based on LDAP Connection Manager. In this section we will show you how to set up an LDAP Connection Manager to access your LDAP Server. When the list of connection managers appears, scroll down the list to find the LDAP connection manager and select it. Click the Add button. Once the connection manager dialog opens, under the Server tab, enter the URL or the server name for your LDAP Host. Enter the User name for your account on the LDAP Server. Congratulations! You have successfully configured an LDAP connection manager. 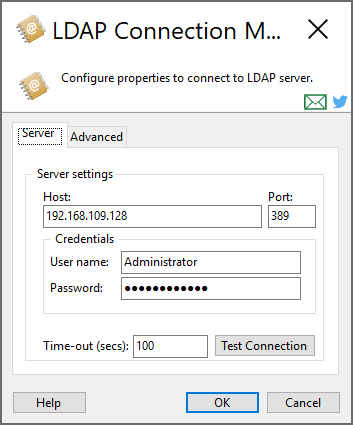 Use the Server page of the LDAP Connection Manager dialog to specify properties for connecting to LDAP service. Specify the port number on the LDAP server to use for the connection. The default value of this property is 389. Specify user name to access LDAP. Specify password to access LDAP. Use the Advanced page of the LDAP Connection Manager dialog to to specify additional properties if your server configuration is different from the default. Anonymous Indicates that the connection should be made without passing credentials. Basic Indicates that basic authentication should be used on the connection. Digest Indicates that the Digest Access Authentication should be used on the connection. Dpa Indicates that Distributed Password Authentication (DPA) should be used on the connection. External Indicates an external method will be used to authenticate the connection. Kerberos Indicates that Kerberos authentication should be used on the connection. Msn Indicates that it is authenticated by “Microsoft Network Authentication Service”. Negotiate Indicates that Microsoft Negotiate authentication should be used on the connection. This is the default option. Ntlm Indicates that Windows NT Challenge/Response (NTLM) authentication should be used on the connection. Sicily Indicates a negotiation mechanism (Sicily) will be used to choose MSN, DPA or NTLM. This should be used for LDAPv2 servers only. Where can I find the documentation for the LDAP Connection? The LDAP Destination Component is an SSIS Data Flow Component for loading data into an LDAP object. The configuration parameters are provided in the standard data flow destination component dialog. Create Create new instance in the destination LDAP object. Update Update existing instance in the destination LDAP object. 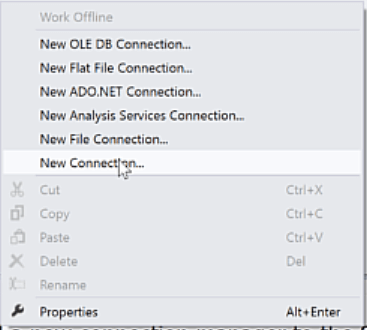 Delete Delete existing instance from the destination LDAP object. Specify the destination LDAP object where the data is loaded. Where can I find the documentation for the LDAP Destination? Fixed: Update action failed with error "A value in the request is invalid." (Thank you, Doug).